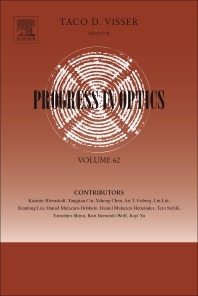 Progress in Optics, Volume 62, an ongoing series, contains more than 300 review articles by distinguished research workers that have become permanent records for many important developments. In this updated volume, users will find valuable updates on topics such as optical testing, the modern aspects of intensity interferometry with classical light, the generation of partially coherent beams, optical models and symmetries, and more. This book's contributions have become standard references in scientific articles, providing the state-of-the-art to researchers and practitioners who work in the field of optics. Taco D. Visser is a Professor of Physics at Vrije Universiteit Amsterdam. He has published more than one hundred papers on various topics in optics, such as scattering, diffraction, waveguides, coherence theory, singular optics and surface plasmon polaritions. Next to his theoretical work he is also actively engaged in experiments in nano-optics.